In October of 2018, Divine Flavor, grower/distributor, launched a campaign focusing on 6 different pillars- all relating to the commitment of growing Better Food for a Better World. A program already implemented for the product they grow, the pillars require other growing partners of the Divine Flavor brand to meet this benchmark, having yearly audits with Primus GFS, which is a fully recognized auditing scheme covering GMP and GAP scopes. The philosophy of these pillars, particularly relatedto food safety, has been in place since the company was established back in 2007. However, as the FDA introduces final rules on the Foreign Supplier Verification Program (FSVP), growing product for the final consumer’s long-term well-being and health becomes increasingly important as the agricultural industry faces its biggest change in recent years. Divine Flavor and its producers are located all throughout Mexico, and regions of Peru and Chile, coveringa wide scope of product, ranging from bell peppers, cucumbers, grapes, tomatoes and squash, available in both conventional and organic. As Divine Flavor and other growing partners enter their respective season, they are evaluated and approved on a continuous basis to verifysuppliers havevalid audits from Primus and food safety plans evaluated by other 3rdparty auditors who help assist with FSVP activities. Michael DuPuis, the Quality Assurance and Public Relations Coordinator explains how Divine Flavor and its growing allies approach food safety and come to an understanding. “We have very good relationships with the other growers we work with, as they share the same motives as our own ranches. There are so many areas involved whether it’s discussing volume and quantities, different pack styles or presentations, but food safety always remains the same- Meet the highest standards, every time”. He continues to mention how these requirements are met and how they benefit the final consumer and retails partners. “These different audits by Primus GFS require constant training and up keeping to ensure their food safety plan meet certain criteria. It’s important for our customers and retailors to know the produce we grow and sell meet elements recognized by North American markets". To help understand the grower’s perspective, two suppliers of Divine Flavor were selected to share their opinions and insight on the issue. 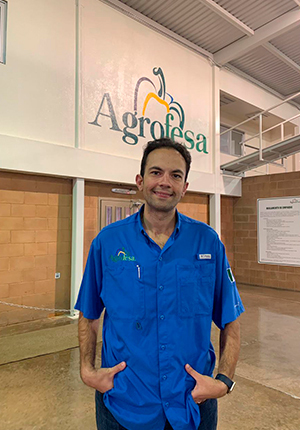 We spoke with Cesar Ortiz, owner and manager of operations ofAgrofesa, a Sonoran-based grower and Anaily Almejo, certifications and food safety manager of AC1 Cueto/Agricola Cueto, a Sayula-based grower, both who specialize in organic fruits and vegetables. When asked what challenges his company has faced, Cesar notes, “Thebiggest change has been implementing a work culture for all areas of the operation”. Anaily Almejoadds from his perspective, thebiggest change is the mentality. "Food safety programs are not only a requirement, but an activity that guarantees our product is healthy". César Ortiz, dueño y administrador de Agrofesa. 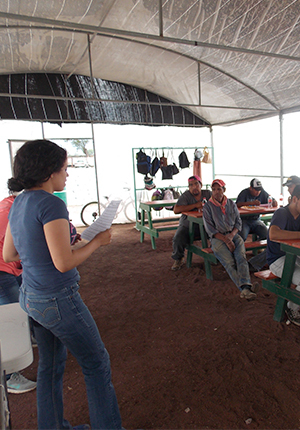 Anaily Almejo, Gerente de Certificaciones y Seguridad Alimentaria de AC1 Cueto / Agricola Cueto, y su equipo reciben capacitación para la auditoría de seguridad alimentaria. Primus GFS has been a well-accepted auditing scheme recognized by most US and Canadian retailers, and many growers agree it truly keeps them prepared for food safety. “It’s a sequence of safety and quality measures which need to be carried out day after day. The Primus GFS scheme is one of the most complex programs which establishes exportation without problems,” Almejo explains. “It ensures all areas and processes are in compliance”. Cesar Ortiz agrees that the scheme evaluates every single corner of his operation from a food safety standpoint. “The Primus GFS audit helps facilitate our critical control points”. The Food Safety Modernization Act’s (FSMA) final rules on the FSVP was implemented so thatimporters couldevaluate and approve suppliers whodemonstratedthatall risk wereidentified and controlled. Ultimately, this regulation is in place to allow consumers to feel confident thatthe produce they are purchasingis meeting the same safety guidelines mandated in the US. Ortiz confirms, “Consumersshould feel confident since nowadays there’s a lot of regulation and control on the import companies,” when asked why shoppersshould feel confident about the produce they purchase. Almejo adds, “In addition to the suppliers having all the certifications and full compliance with the requirements, they are also conducting periodical analysis so a guarantee is made that products is safe and healthy”. “Our own ranches and other growers we partner with play a vital role as they are the first level of defense in the supply chain. It’s important to partner with growers similar to our own which have strong food safety plans. They must share the same philosophy, to produce delicious, safe, and healthy product for us to sell to our customers,” says Carlos Bon, Sales Manager at Divine Flavor.